Do you have a Facebook account? Do you use regularly it regularly? I am asking this question because you can now use it for giving gifts to someone you know for this holidays. I use my Facebook to spread news about my recent activities. There are some stores that will allows you to buy their products by using the Facebook fan page. I want you to know that you can now buys an iTunes Online Gifts through their fan page. You can send it to your family and friends directly to their Facebook wall. They can redeem their gifts to the iTunes Store and choose in their wide selections of movies, music, TV shows, audiobooks and more. 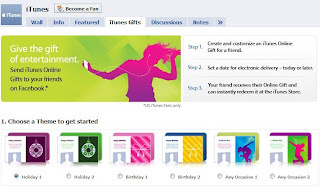 The new service of iTunes Online Gifts are available in United States through the iTunes Fan Page. This is a great idea that is very easy to gain access to all who has Facebook accounts. Giving a gift cards to your family and friends are a great way to let them choose what they want to get out of the gift cards that they receive. You can also download the iTunes 9 for free to your Mac and PC. For more information about this online gift cards of iTunes just click the links above. See you there. Wow, I didn't know about this app on Facebook for online gifts, nice for you to share, will check it out. I am not happy that this app is only available in the US, it should be made international.